Shaving often comes across as a mundane daily chore. However, it’s actually a luxurious privilege that can be turned into a pleasureful experience. The beard phenomenon may not be disappearing altogether but a clean-shaven face has become fashionable again. A love of wet shaving may have been a niche and obscure passion but films like Skyfall have brought straight razors back into popular culture. Many wet shaving enthusiasts have embraced its fascinating culture by immersing themselves in its deep historical roots. However, getting started can be daunting for the newcomer. Therefore, we have created the internet’s most comprehensive guide to wet shaving to soften that learning curve. What Can You Learn About Shaving With Bespoke Unit? Wet shaving is the act of removing facial hair with the presence of water or liquid unlike electric shaving. Furthermore, it is often associated with using creams and soaps instead of canned foam. Firstly, even with the most expensive straight razor or safety razor, you can save money as it will last a lifetime. Safety razor blades cost as little as 9¢ each and a razor blade can endure several generations if well-treated. Furthermore, both are far friendlier for the environment than using cartridge or electric razors. Whilst electric razors consume electricity and are made from various small parts, cartridge razor blades are impossible to recycle. Finally, learning to use either tool takes practice and patience. However, you will develop an undeniable skill and improve your hand-eye coordination. If you have children, you can even pass down both the knowledge and the razor itself as a heirloom. Although the traditions of wet shaving may have faded over a few generations, there’s no reason it can’t come back. After all, even the Romans were passionate about shaving and considered trips to the barbershop social events. If the art-form survived the Dark Ages, it can survive the 20th Century. What Are The Different Types Of Straight Razor? What Are The Different Types of Safety Razor? Shavettes VS Straight Razors: Which Is Better For you? What Are The Best Shaving Soaps & Cream? What Are Shaving Brushes & Why Do You Need One? A Full & unabridged guide. BU's Shaving Series is the most comprehensive initiation to wet shaving on the internet. Bespoke Unit's Shaving Series Reviewed by Charles-Philippe Bowles on December 7th . In the age of wireless charging and streaming, the popularity of electric and cartridge razors is actually waning. Surprisingly, more and more people are turning to old-school tools such as safety and straight razors. In this very page, you can read a glimpse of what our shaving series has to offer by learning the basics to wet shaving. The following step-by-step guide can be applied to any type from straights to safety and cartridge razors. Reading this will familiarise you with the traditional process of shaving and prepare you for our more advanced guides with specialised razors. Before the razor even touches your skin, you’ll need to properly prepare it. By preparing your skin, the objective is to soften the stubble as well as opening the pores. This will make the work easier for the razor to cut through your hairs. If you neglect to do this, shaving is a much more difficult process and can cause irritation. The razor will struggle to cut through the hairs as easily and the skin can be left feeling sore. For added protection, you can apply a pre-shave cream. We recommend Proraso’s Crema Pre Barba, which features refreshing eucalyptus. Before you begin shaving, you need to check that your razor is ready to use. There’s nothing more disheartening than taking all the steps to prepare only to realise that your razor is blunt. Making a razor shave ready depends on your choice of blade. If you opt for a safety razor, you only need to ensure that the razor blade is clean and sharp. Choosing the right one for your skin type can be challenging so check our detailed razor blade guide to learn more. However, straight razors require more planning and preparation. Make sure that the cutting edge will easily slice hairs with sharpness tests. If it’s too dull, it may need honing. Nevertheless, a straight razor almost always needs stropping before every shave. You can learn all about testing, stropping, and honing straight razors with our dedicated straight razor sharpening guide. One of the most important and easy to master fundamentals to a smooth shave is learning to properly lather shaving soap. Poorly lathered shaving soap can be too frothy, runny or even too thick. The former means that you won’t get the necessary protective cushion while shaving, which will cause nicks and soreness. Meanwhile, the latter makes it impossible to trim the hairs. Dive into our lathering guide to learn how to prepare soaps, creams or even gels and foam! Cartridge razors have spoiled us with their happy-go-lucky flexible heads, which allow you to swipe all over your face for a clean shave. In fact, they’ve taught us some bad habits and many frequent cartridge razor users suffer from irritation without knowing why. Firstly, take great care with the angle you shave with. The sweet spot for both straight and safety razors is around 30° but any more than this can be too aggressive for your skin. Always take into account your beard growth’s grain, which is the direction the hairs grow. Start by shaving with the grain and never against it. By cutting in the direction of growth, you won’t irritate the hairs but only slice them away. Although the below infographic is a handy reference, everyone’s growth is different. Learn yours by growing your beard out for a few days to see the direction it grows. Plan your strokes before you shave by looking at your face. It’s always better to start from the top and work your way down. This way, you will remove hair higher up before the lather sinks off your face with gravity. Always apply very little if any pressure at all when you shave. As we will discuss in the next step, the goal should be beard reduction and not beard removal in the first pass. If you try to remove all the hair in one single pass, you’ll have to press the blade too hard against the skin. This results in extreme irritation and inflammation, which can be sore for a few days. Therefore, don’t worry if you still have stubble after your first pass. Simply lather up and get ready to go a second time. At this point, you could consider going across or against the grain. 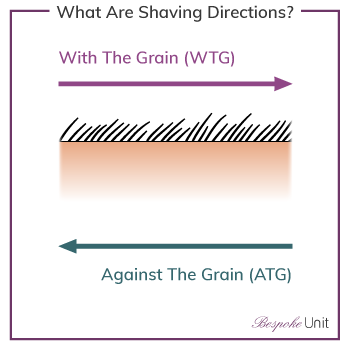 Against the grain can be quite aggressive with some razors and on sensitive skin. Therefore, a suitable compromise for many people is to shave diagonally across it. This will allow you to benefit from a close shave whilst reducing irritation. However, by no means feel that you must finish in your second pass. Repeat the process as many times as necessary while applying the lightest pressure possible. Now that you’re satisfied with your shave, be sure to take proper care of your skin afterwards to avoid any further irritation. As gruesome as it sounds, start by blasting your skin with cold water. Whilst hot water sounds more comforting, its relief is short-lived. However, cold water closes the pores and capillaries, which reduces bleeding and irritation. Once thoroughly rinsed, use a combination of moisturising creams, balms and even alum for your post-shave regimen. There are several varieties of treatments for a soft and hydrated face, which you can learn about in our dedicated post-shave guide. Having learned the basics of wet shaving, you can now explore all our related topics and specialise your knowledge. Simply head back to our main shaving menu to discover all the topics we cover. Charles-Philippe is a Franco-Briton who lives in Brie country half-way between Paris and Champagne, France. His passion for wine and cheese is only equal to his interests in personal grooming, fragrances and vintage clothing. See his full profile here, and read latest articles. After your kind words on the Pinaud Clubman review, I’m glad to see you discovered the shaving content, Mark! Hope you enjoy touring around all the guides we offer on wet shaving!